Bishop's Boxers: A New Year, a New Litter! A New Year, a New Litter! Good News! 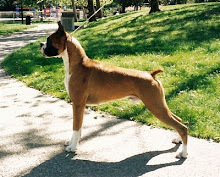 Maddie was bred to Henry from Telstar Boxers (click here to visit Telstar's website) October 31. We are looking forward to having a new litter of puppies on (or about) January 2, 2013. Maddie is from Lady's second litter and is one of the sweetest dogs. We called her Prancer (you can see more puppy pictures of her if you scroll down the blog). If you are interested in a puppy from Maddie, please contact us to be placed on the interest list. As always, we will keep the blog updated so you can follow the litter.